Sirens, whatever else they may be, are surely communications, soundings to alarm or to allure. The poems in Alexandra Mattraw’s recent collection small siren perform both functions at once, signaling that language—that great bridge between thoughts and things—has begun to sway dangerously yet beautifully, and that its structural stresses are approaching the “yield point” of the sublime. To us, living in the twenty-first century, the meltdowns of meaning instigated by capitalism’s acceleration of history have become second nature. Traditional practices, and the discourses that support them, are going extinct as rapidly as most animal species. Caught up as we are in the matrix of the media spectacle, we barely notice their disappearance. By now, we have accepted the ways that meaning, right before our eyes, can “flow or change shape permanently.” Thus, writing that represents an existence composed entirely of yield points defines a new brand of realism. One poem’s title states “You must build a new bridge before demolishing an old one,” implying that meanings must continue to cross the divide (between subject and object, you and I) even while reconstruction takes place. 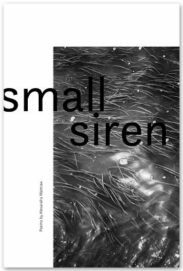 Throughout small siren, the poet at once questions and makes visible the verbal bracework of our relations to others: how even the most effervescent meaning is riveted to mind, how our grammars provide “sway bracing” against the vicissitudes of love and death. There is a cool objectivity, something of an engineer’s measuring gaze, in the poet’s assessments of whether, and how long, the language-bridge between I and thou can endure. The ever-present threat of structural failure, a sense that life must be conducted within swaying constructions, imbues these lines with tense vibrancy. Suspension bridge as lyre: the poems are tightly strung, the notes plucked carefully by the player. In the end, however, the cables cannot hold. Following a poem (“Reconstruction: Christchurch, New Zealand”) that describes buildings destroyed by an earthquake, the collection’s last four poems consist of words scattered across the page, as if in the aftermath of a collapse. To be free to move, any meaning must be smaller than its own space of possibility. A “cry that could have room,” therefore, must always be a small siren. This entry was posted in Uncategorized and tagged Spring 2019 on April 12, 2019 by Kelly.